For this project my team was tasked with creating a standalone, museum-worthy interactive installation that explained a complex scientific concept. The idea was that through our educational interactive experience, users would get a high level understanding of the scientific topic in a way that would be engaging, social, and memorable. We chose to work with a scientist whose research looked at the link between exercise and memory formation. On this project I worked on the Interaction and UX Design as well as the Sound Design and Composition. We all contributed to the storyboarding, conceptualizing, and research involved in creating this game. The team I worked with consisted of two Unity developers, a 3D graphics specialist, and a motion animator. The project was displayed in May 2013 at the ITP Spring Show and later in the month at the World Science Festival's Innovation Square. We chose to use the research of Dr. Wendy Suzuki, an esteemed neuroscientist at NYU who studies the link between exercise and long-term memory formation. In order to be able to create an educational experience for others, we needed to understand the complex research she had been conducting, how the brain processes memories, and what kind of exercise helped to create long-term memories. We came up with a guiding principle to help inform our designs: we wanted users to understand that aerobic exercise leads to long-term memory formation. This principle helped us to design for the right aspects of this complex research. The premise of the game is that a user becomes a ball of energy moving along the axon of a neuron. Players must exercise by swinging their hips side to side to move forward in the game; users earn points by jumping to catch a protein called BDNF that improves conditions for memory formation. When more than three BDNF proteins are caught, players win the game and they "form a memory" in the game. In order to have users understand the premise and rules for the game, we had a short introduction that set up the baseline intro to the science behind the game. The intro loop was intentionally concise and required users to acknowledge the message by jumping to start the game. From here the user would be instructed to shake their hips from side to side to move forward and jump to catch the BDNF floating above their path in the game. 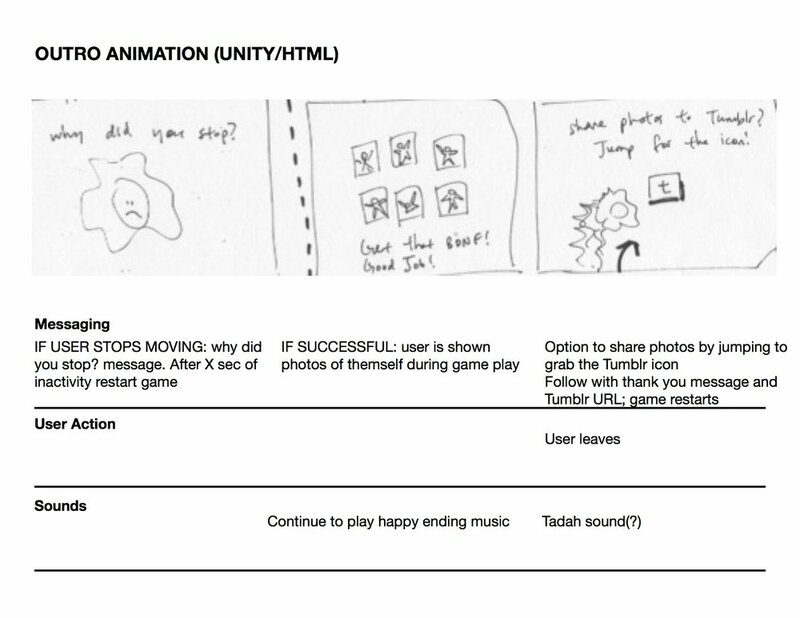 We created storyboards that helped to map our animation, sound, and user experience of the game. This process helped us create a common language for design and development so there was little confusion about the assets and modules we were both working on. Since we were working on a tight timeline it was important to make sure that we were on the same page and could work in tandem. Since the game required a lot of physical movement from players, we needed to make sure that all of our equipment was properly placed and secured. We created a schematic that outlined how we wanted our screen, Kinect, and info panel to be positioned. This was the optimal arrangement that enabled the Kinect to clearly see the user and for the user to be able to play the game and move freely within the space. The final game was showcased at the Interactive Telecommunications Program (ITP) Spring Show 2013 and the World Science Festival's Innovation Square in May 2013. We all contributed to the storyboarding, conceptualizing, and research involved in creating this game. Below is a video that shows the game in action at the ITP Spring Show 2013.